Colourful, vibrant and detailed Noah’s Ark bookends were such a unique present. Our son still enjoys looking at them now whilst they hold his books up for him, even though they were a christening present. The Wooden Noah’s Ark Bookends are well made and well thought out as they have got square rubber pads on the bottom to stop them slipping which is such a great idea. This LEGO DUPLO 10570 Creative Play All-in-One-Gift-Set compliments all other LEGO DUPLO sets. The bricks are brightly coloured and can be used to make lots of different things. Having a sturdy plastic box is great for putting the LEGO DUPLO in too. 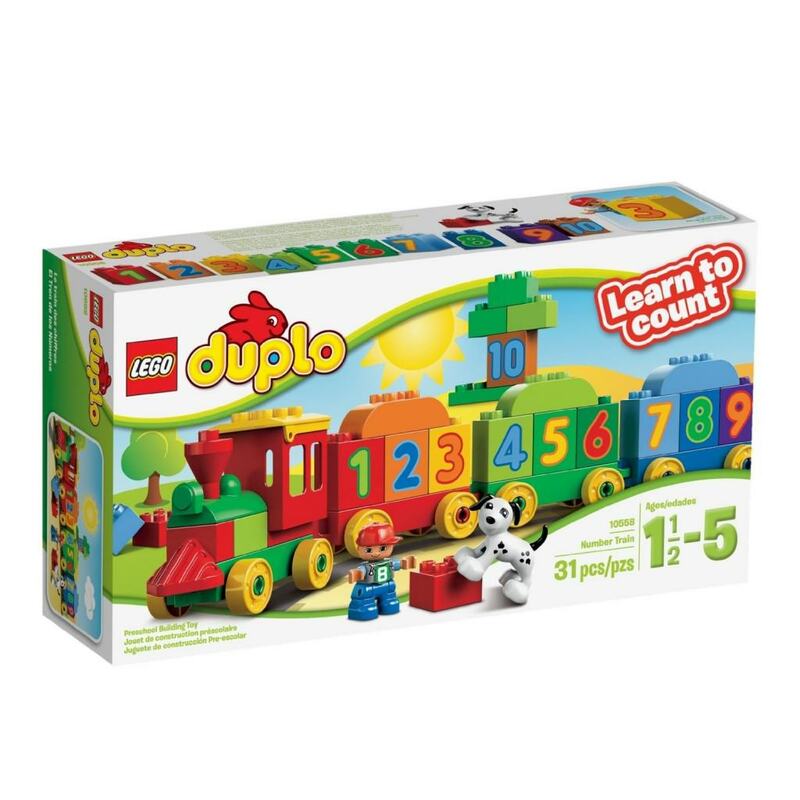 This LEGO DUPLO Number Train was a birthday gift to our son and we think it is a fantastic way for the little ones to learn numbers. The different bright coloured blocks are attractive to the little ones and once there are 10 numbers on there they can pull it along. We have had great fun with this toy and it really encourages early learning of numbers. This activity triangle is a good toy to have on the floor when your little one is young as it is very stable and they can grasp it easily. It starts to introduce fine motor skills with pushing and pulling the shapes whilst also they can rattle beads, spin the spinning wheel and admire themselves in the mirror. Coloured links which can be used for so many different activities. We used ours to link a certain toy on, to stop toys falling out of the buggy and to encourage fine motor skills with our little boy trying to link them. The vibrant colours are eye catching and our little boy found them very easy to hold because of their size. He also used them to chew on when teething and they wipe clean very easily.